Working at Saturday’s or Sunday’s Bread involves a commitment of about four hours, not including travel time. 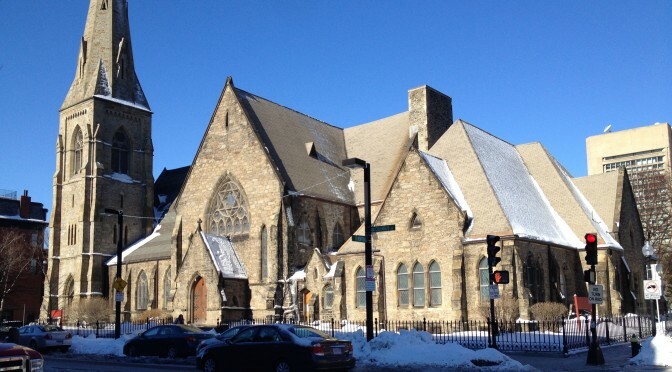 The schedule is 2:00 PM to 5:30 or 6:00 PM at Union United Methodist Church, 485 Columbus Avenue in Boston. Guests are served from 4:00 to 5:00 p.m. Cleanup follows from 5:00 to 5:30 or 6:00. Everything is well prepared in advance to make effective use of your time, but expect to work hard for four hours. The day’s work is overseen by a Kitchen Executive, an experienced, specially-trained volunteer who assigns jobs and makes any other decisions required. 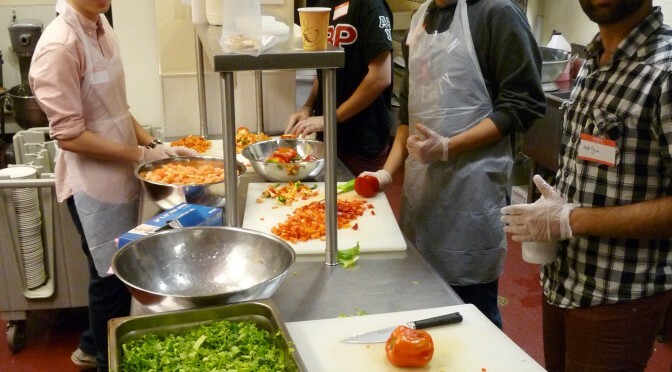 Youths aged 15 to 17 can work in the kitchen, but are not allowed by state law to serve tables in this restaurant-style setting. There’s plenty of work to do setting up, helping the flow of plates from the kitchen to the dining room counter and cleaning up. Saturday’s/Sunday’s Bread is very popular with youths. This is an ideal activity for parents and their children or teens doing a community service project. Volunteers need to be on site downtown, ready to work at 2:00. You may want to carpool or take the T. See our Directions page for a map and parking and public transit information. Be sure to have a meal before you go. Wear comfortable, rubber-soled shoes (floors can be slippery) and clothes that you won’t mind getting a little dirty. Bring an apron if you want to wear one; a limited number should be available from the Kitchen Executive. Do not bring food. All the food for the meal is arranged in advance. Collections of toiletries (from hotel stays, for example) are always welcome, but try to bring a fairly large number. We distribute clothing only through a special program. Contact Mark Metzger if you are interested in donating. When you arrive, sign in at the counter, make yourself a nametag and ask for the Kitchen Executive to get your first task. There is a brief meeting about 15 minutes before the doors are opened, during which specific jobs are assigned for the meal service. Several people will work in the kitchen, putting the meals on plates, several more will serve as waiters, bringing the meals to the guests seated at tables. One or two may be assigned to serving coffee. One person will be designated the doorman, with responsibility to control the flow of guests into the dining hall and to keep a count. One person will be designated the maitre d’, with responsibility for directing guests to tables and coordinating the waiters. At the end of the meeting the volunteers usually join hands for a moment of reflection. Many of the volunteers come under the auspices of a religious organization; however, doctrinal discussions are not allowed, either among the volunteers or with the guests. In general, there are no seconds until around 4:40 or 4:45. About then, the Kitchen Executive will decide whether to offer seconds, based on his or her assessment of the remaining supply of and the demand for food. Under city health code regulations, guests may not take food home. If feasible, identify up to 20 to 25 potential volunteers to participate in your group. Plan to send a team (typically four to six volunteers) on a regular schedule that you and your group determine: E.g., Every four, six or eight weeks — or once or twice a year. Designate one or two coordinators who can organize the group for each scheduled Saturday or Sunday and serve as a contact point for the team’s coordinators. Designate a delegate to attend Saturday’s/Sunday’s Bread board meetings three times a year. Commit to an annual financial contribution.